In this age of reboots and remakes, you can’t help but wonder—even worry—any time the word “reunion” is used that a “major announcement” will shortly follow. Seriously though, can’t we all just reminisce about how great a show was without fearing that it will spark a subpar reboot from a network?! Well thankfully, this weekend’s Scrubs Reunion was just that. In what the panel (featuring stars Zach Braff, Donald Faison, Sarah Chalke, John C. McGinley, Ken Jenkins, Judy Reyes, Neil Flynn, Christa Miller, and creator Bill Lawrence) described as the “first one of these things we’ve all agreed to”—namely because of the free booze—the vibe at the Scrubs Reunion was truly just that of friends reflecting on fond memories. 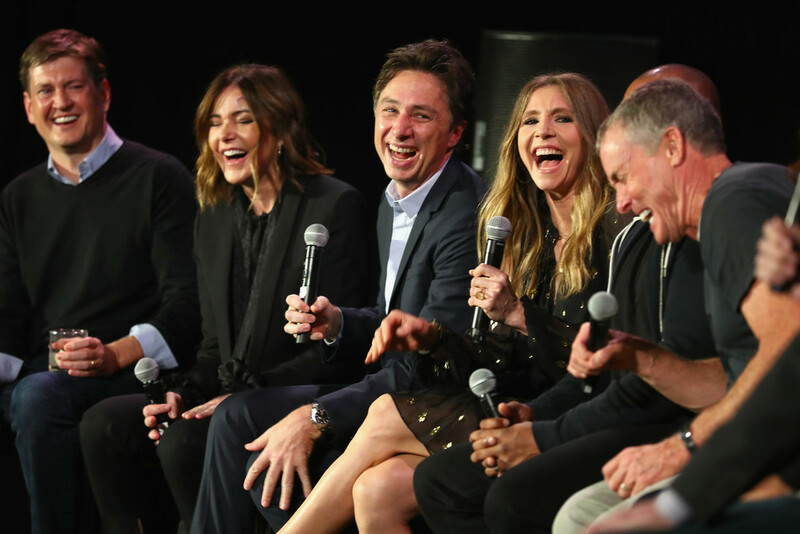 Whether it was laughing about Sarah Chalke’s inability to finish a scene without breaking or trying to understand all of the multiple layers of The Janitor, there were plenty of laughs and “remember whens” at this reunion. Most importantly there was even a surprise appearance from The Todd—notably not invited to speak on the panel, but he made up for it but showing up in his full costume, banana hammock and everything. The panel even had to stop at one point because they had fallen down a deep hole of their own inside jokes before remembering the audience wasn’t in on all of the jokes. Creator Bill Lawrence did reference and express gratitude for the intense dedication and love from the fans of Scrubs as one of the main reasons the show was able to be as bold as it was. Yes, Scrubs was a hilarious comedy with wacky fantasy bits and slapstick delivery, but it also dared to be real by dealing with solemn topics such as life and death. In the fourth episode, the viewer and doctors in training are all told that on average 1 in 3 patients admitted will die; however, the surprise—SPOILER ALERT—comes when all 3 of the patients-of-the-week die, and the characters are left to deal with the finality of death. Lawrence acknowledges that taking a major turn like that so early in a show’s course could have been the kiss of death for Scrubs, and the studio even advised against it. Thankfully, Lawrence took the risk and the fans loved it; Scrubs set itself apart from other network comedies of the early ’00s because of its ability to balance comedy and drama, all in 22 minutes. So why no reboot? According to Lawrence, it is both because reboots feel like a cash grab, and all of the actors seem to be doing fine. Lawrence jokingly promised that if any of the actors on the panel were in a crisis, he would help them out—but only with a “small movie” and only in the form of a “where are they now.” Thankfully the cast of Scrubs is, in fact, doing well, so there is no need for the stress and worry of a “will they or won’t they ruin my favorite TV show.” Instead, we can all just gather seventeen years after the premiere and laugh about what it means to know that you’re no superman. Constance Wu has lived one hell of a 2018. Not only has she been able to trade in her ‘06 Prius and swap out her apartment for her very own house, but she’s also enjoyed the fifth season of ABC’s Fresh Off the Boat and starred in the major romantic comedy hit of the year, Crazy Rich Asians. 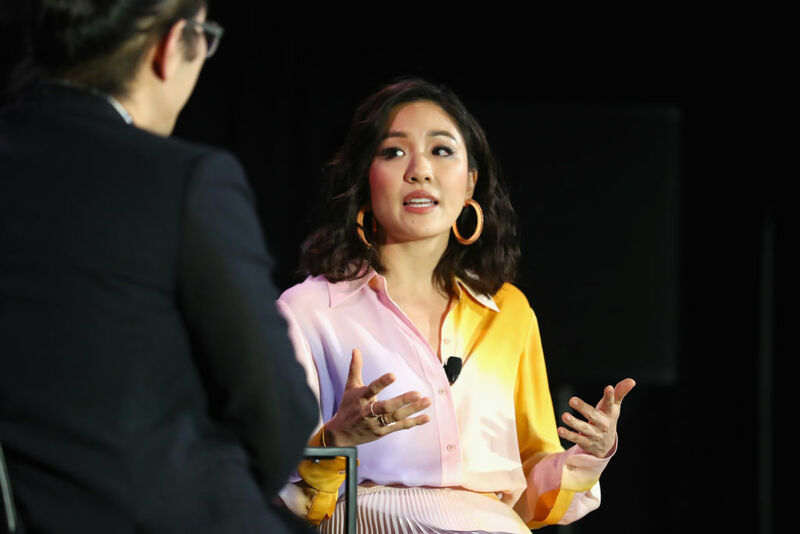 This has been an amazing year for Wu, but she mentioned that it has not always been easy, particularly because she felt a lot of anxiety surrounding Crazy Rich Asians—and not about whether it would be a box office hit or slump. Rather, she was worried about what it meant for such an underserved audience. A reflection is the best way to sum up Saturday’s conversation; yes, there were questions about both her TV and film projects, but mainly, the conversation focused around her Asian American identity and what it means to be a woman in Hollywood during the era of #MeToo. Wu mentioned that she, like most Asian American actors, struggled at first with how her identity would play out in her characters. At first, she said she wanted to play parts that didn’t take race into account at all, but as time has passed, she realized that doing this was robbing her characters of a fully formed identity and experience. A character’s race (or gender, sexual orientation, and so on) should not be the only thing defining a character, but it is a large part of how the character sees themselves and how they fit into their worlds. Wu said that to ignore her race in the efforts of “color blind” casting was to erase her lived experiences and oversimplify these characters. By taking on roles such as Jessica Huang in Fresh Off the Boat and Rachel Chu in Crazy Rich Asians, Wu has been able to utilize her lived experiences and elevate characters that are not just complex and fully formed, but most importantly, real. A theme that lasted throughout the conversation was challenging the notion that anyone should have to soften their experiences for someone else’s comfort. This came up frequently while talking about her experience as an Asian American, and specifically an Asian American actress, but it was also discussed when speaking about what it means to be a woman during a pivotal time in Hollywood history. Wu’s struggles—and honestly, one I very much related to—was best summed up in her recent panic over whether to use an exclamation point or a period in an email. Her point was that women used exclamation points to soften the blow of their sentences; she argued that by ending “can’t wait to discuss this further with you” with an exclamation point, she intentionally created a more easygoing and cheerful sentiment in comparison to the same sentence with a period, which would have been more forceful and direct. With this example, Wu addressed the idea that as a woman, she is expected to put other people’s comfort over her own truth and experiences. In the end, she said that she—with the help of her therapist—decided that it’s still ok to use exclamation points, but not to fall back on them when you mean the sentiments of a period. 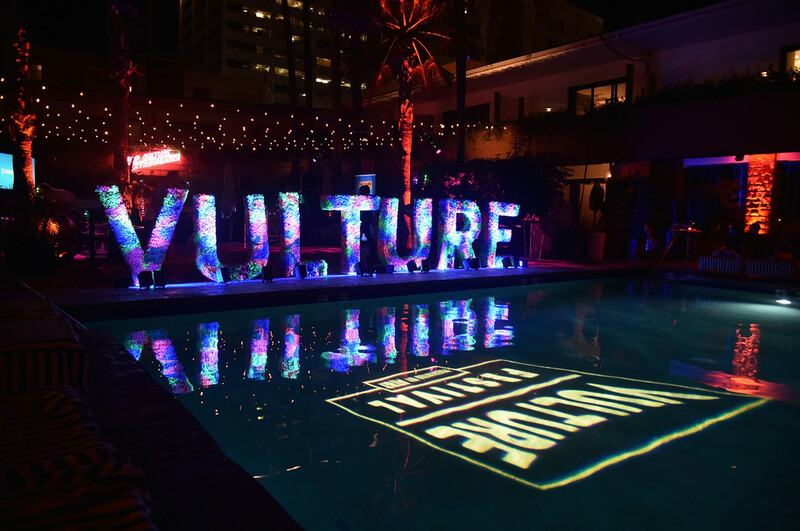 Ever the entertainer, Wu kept the conversation from lingering too long in the shadows of these complex topics by peppering the conversation with fun facts. My personal favorite was Wu’s obsession with Ariana Grande’s “Thank U, Next.” For the record, Wu loves the song because she believes it is using both an exclamation point and a period—which is where she seems to want the future to be.